Commemorating and remembering the lives of the men and women of Chailey, Sussex during the Great War 1914-1918 and remembering too the sick and wounded soldiers nursed by Sussex 54 VAD. This is their story. Montague Gates was born on 16th November 1882 although the date he gave on enlisting with the Royal Navy was 1st September 1880. He enlisted on 6th September 1898, to all intents and purposes, 18 years and five days old. In fact he was 15 years old. He was the son of William and Sarah Gates of The Green, Chailey and appears on the 1891 census living at the family home on Chailey Green. The family comprised William (a bootmaker), his wife Sarah, Montague (aged eight) and Harry Gates (aged one). Harry would later be killed in action during the First World War. He is described on his naval papers as being five feet, five inches tall with light brown hair, hazel eyes and a fair complexion. He also had a number of tattoos (although whether this information was added when he joined up as a fifteen year old, or whether the tattoos were added later on in his service is unclear). In any event, the following designs are noted: Japanese lady, snake and peacock on right arm, necklace of leaves around neck, flowers and face in leaf on left arm. He gave his occupation as page boy. For his work during the Battle of Jutland, Montague Gates was advanced to the next higher rating (chief petty officer); effective from the date of the battle itself: 31st May 1916. On 27th October that year he was officially commended for his service in that action. During his time with the Royal Navy he received three good conduct badges (21st May 1906, 20th May 1911 and 20th December 1912). His record is interesting, not only for the number of ships he served on but also for his transfer from the rating of stoker to that of telegraphist and it is possible that he answered a call for volunteers to train on the new technology. The role of a stoker and that of a telegraphist were very different but the transfer was approved on 20th November 1907 and Gates obviously excelled in it. He signed on with the Royal Navy for 12 years on 22nd May 1903 and then opted to complete 20 years (in order to obtain his pension) on 22nd May 1915. As well as his general Great War entitlement medals, Gates was also awarded the Long Service Good Conduct medal. The once famous flagship of Sir Charles Napier. Relegated to harbour service as one of the depot ships for berthing the men of the Portsmouth Dockyard Reserve. Sold in 1904. HMS Hannibal. Royal Naval battleship of the Majestic Class. HMS Hannibal was refitted and converted to burn oil fuel as well as being fitted with fire control in 1906. Recommissioned in the Channel Fleet Reserve in October 1906 and transferred to Davenport as part of the Home Fleet in July 1907, remaining there until 1914. During this time she struck a submerged reef off the Devonshire coast in August 1909 and collided with TB105 in October that same year. She was refitted and served as guard ship of the Humber from 1914 and later went to Scapa Flow. She was then converted to a troop ship, being disarmed at Dalmuir to provide 12in turrets for Prince Eugene and Sir John Moore, moving to the Mediterranean in September 1915. From 1916 - 1919 HMS Hannibal served in the East Indies and in Egypt and was sold in January 1920. Armament: four 12 inch guns, twelve 6 inch guns, sixteen 12 pdr guns, twelve 3 pdr guns, 2 maxims, two 2pdr boat guns and five torpedo tubes. Displacement: 14,900 tons. Speed: 16.5 knots. Complement: 757. HMS Canopus was built at Portsmouth dockyard, laid down on the 4th January 1897, launched 21st June 1898 and completed December 1899. Only one of the class to serve in the Mediterranean fleet instead of the China station until returning to the Channel fleet in 1906 and in that year went into refit to receive fire control. Further refitting was done while with the reserve at Portsmouth with reduced crew in 1908-09. On returning to the fleet she served as the parent ship for the 4th Division at the Nore and was with the home fleet from May 1912 and again refitted at Chatham dockyard. In 1913 HMS Canopus was stationed at Pembroke and at the outbreak of the Great War joined the 8th battle squadron of the Channel Fleet. Soon after she was sent to the Falkland Islands and is said to have fired the first shot in the battle of the Falkland islands. From February 1915 she was sent to the Mediterranean to support the Dardanelles' expedition. While there she was damaged by Turkish gunfire on the 28th April and 2nd May 1915. She was involved in grounding off Gaba Tepe. In October 1915 she transported troops to Salonika. She returned to Chatham Docks on Tuesday 2nd May 1916. On returning to Britain she became the guard ship on the East Coast until 1918 when she was sent to Devonport. There she became an accommodation ship until being sold to the breakers in 1920 . Displacement: 12,950 tons. Length: 410 ft. Beam: 74 ft. Draught: 26.5 ft. Complement: 750. Armament: four 12 ins guns, twelve 6 ins guns, ten 3 ins guns, six 3 pounder guns and two maxims with four torpedo tubes. HMS Britannia was a Royal Naval battleship of the King Edward VII, Class. Sje first saw service with the Atlantic fleet in December 1906, moving to the Channel Fleet in February 1907, joining the 2nd Division of the home Fleet as Flagship of Vice admiral in April 1909. While serving with the 2nd division she joined the Mediterranean fleet for a short period of time before returning. At the start of World War One, Britannia joined the 3rd battle Squadron of the Grand Fleet. But In January 1915 she ran aground at Inchkeith suffering major damage. On the 9th November 1918 she was torpedoed by UB50 off Cape Trafalgar. Crippled she remained afloat for three and half hours before sinking. She sustainted a number of casualties due to toxic fumes. Armament: Four 4 inch guns in pairs, four 9.2 inch guns in singles, ten 6 inch guns in pairs, fourteen 12 pdr guns, fourteen 3 pdr guns, two maxims and five torpedo tubes. Displacement: 16,350 tons. Speed: 18 knots. Complement: 777. Built at Portsmouth navy dockyard and launched on the 30th September 1909. 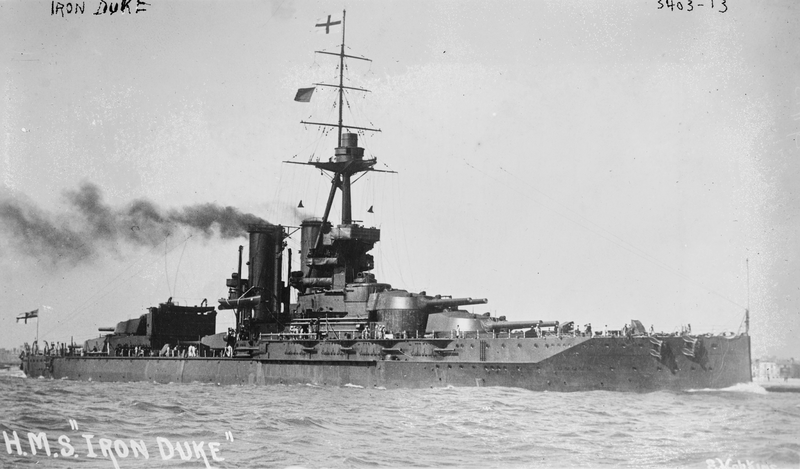 HMS Neptune was the first British Battleship to be able to fire all ten of her 12-inch guns broadside, by allowing the two wing turrets to fire across deck. This though was found to be of little advantage as it placed a heavy strain on her hull. HMS Neptune also failed to reach her contractual speed on trials but did achieve a speed of 21.129 knots during her acceptance trials on the 17th November 1910. In May 1911 HMS Neptune became the Flagship of the Commander-in-Chief of the Home Fleet and in May 1912 she joined the 1st Battle Squadron. She was still serving in this squadron when in April 1916 she collided with a merchant ship but was not seriously damaged. She was at the Battle of Jutland and was reported to have scored several hits on the German Battleship Lutzow. She did not sustain any casualties during the action. On the 1st of February she was put into reserve and eventually scrapped in September 1922. Displacement: 19,680 tons. Speed: 21 knots. Armament: Ten 12 inch guns in pairs, twenty 4 inch guns, four 3pdr guns, three 18 inch guns and 3 torpedo tubes. Compliment: 759. After 1931 she became a Gunnery Training Ship and Base Ship for the Home Fleet between 1939 and 1945. She was scrapped at Faslane in Scotland on 19th August 1946. Compliment 589. Armament 6 13.5 inch Guns (3 x 2 ) and 12 6-inch Guns . Machinery 4-shaft Turbines, S.H.P 31,000 giving a top speed of 21.25 knots this was reduced to 18 knots with mutilated boiler power. Displacement 21,250 tons. HMS Queen Elizabeth was a Royal Naval battleship built at Portsmouth in 1913. She served in the Dardanelles campaign during World War One and during World War Two she was sunk in shallow water by mines attached to the battleship by Italian frogmen in Alexandria. She was raised and repaired at Norfolk, Virginia. Armament: Eight 15-inch guns in pairs and fourteen 6 -inch guns. Two 3 inch Anti Aircraft Guns in 1917, two 4-inch anti aircraft guns. HMS Queen Elizabeth was built at Portsmouth and re-engined at Fairfield. She was launched on the 16th October 1913. She was the sister ship to HMS Warspite, Valiant, Barham, and Malaya. HMS Queen Elizabeth was the only ship of the class to have a full compliment of sixteen 6-inch guns. She was the only ship of her class not be be involved during the Battle of Jutland. Her First World War service included being part of the Dardanelles' campaign. She bombarded the forts on the Narrows in the support of the Gallipoli landings between February 25th and May 14th 1915. She fired a total of 86 15-inch shells and 71 6-inch shells. After the battle of Jutland (during which she was being re-fitted,) she became the flagship of the Home Fleet in February 1917. HMS Queen Elizabeth had two major refits between the wars. At the start of World War Two she was in the middle of her second refit at Portsmouth. Completed and ready for service in May 1941, HMS Queen Elizabeth was transferred to The Mediterranean Fleet. It was at Alexandria, along with her sister ship HMS Valiant that both ships were mined by Italian Frogmen. HMS Queen Elizabeth sank in shallow water, was raised and temporarily repaired. Due to the serious damage she had sustained however, she was transferred to the US Navy Yard in Norfolk where she was repaired between September 1942 and 1st June 1943. She joined the Eastern fleet and from January 1944 onwards was joined by HMS Valiant and took part in the carrier raids in Indonesia against Japanese bases. She returned to Britain in July 1945 and was finally scrapped at Dalmuir on the Clyde 7th July 1948. HMS New Zealand was taken on a cruise of the Dominions in 1913 before joining the 1st Battle Cruiser Squadron. She then served with the Grand Fleet in 1914 before becoming flagship to the 2nd cruiser squadron in 1915. She was built by Fairfield and was completed in February 1912. In February she left for a world cruise around the Dominions which took 10 months. She then joined the 1st Battle Cruiser Squadron on a cruise to the Baltic and then joined the Grand Fleet in August 1914 becoming the flagship of the 2nd Battle Cruiser Squadron in January 1915 until February 1915. At the Battle of Dogger Bank she fired a total of 147 12 - inch shells with out any known hits on the German Ships. She became Flagship to Admiral Beattie when his Flagship HMS Lion was damaged during the battle. On the 22nd April HMS New Zealand and HMS Australia collided but repairs were carried out in time for the Battle of Jutland. During the battle she fired 420 shells, (more than any other Dreadnought during the Battle) but only scored four hits. HMS New Zealand was also hit by a 11-inch shell which hit a turret (luckily without causing any major damage or casualties). After September 1916 she again joined the 2nd Battle Cruiser Squadron and after the war carried Admiral Jellicoe on a tour of the Dominions. Listed for Disposal under the Washington treaty she was sold for breaking up on the 19th December 1923.